Scientists believe genetic variation accounts for much of the risk of sporadic amyotrophic lateral sclerosis (SALS). However, estimates on just how much heritability the known ALS genes confer range from 11 to 28 percent. In the June 21 Neurology, researchers led by Summer Gibson and Jonathan Downie at the University of Utah School of Medicine, Salt Lake City, describe how to better determine that number. Their method takes pathogenicity of rare variants into account. 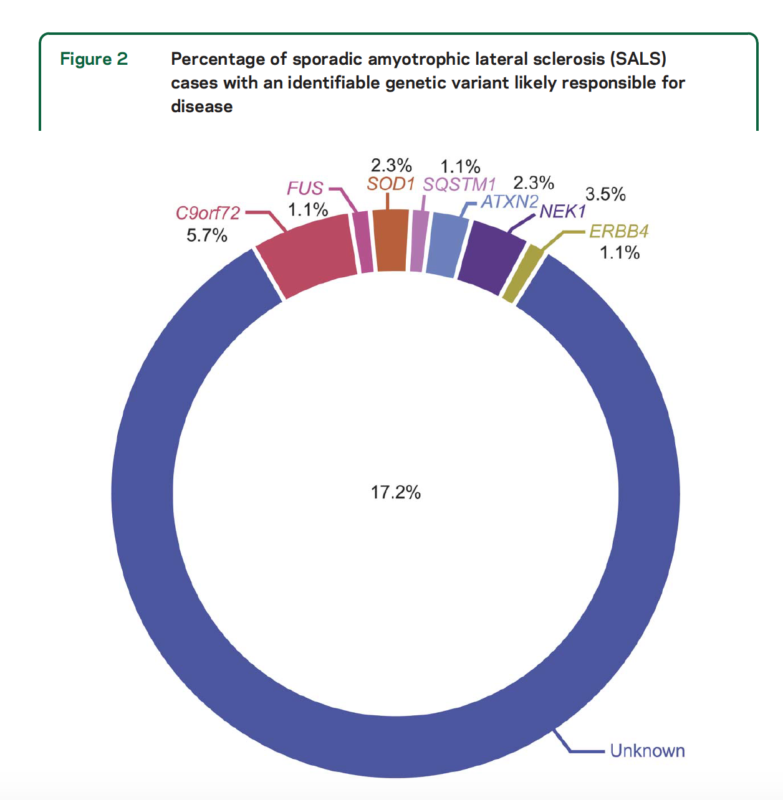 In a small cohort, they found that only 17 percent of SALS cases carried variations predicted to be harmful in the genes known to be associated with ALS to date. This percentage is lower than several previous estimates. However, Downie stressed that additional risk variants in other genes remain to be discovered. In an accompanying editorial, Peter Andersen at Umeå University, Sweden, applauded the use of predictive algorithms to determine how likely a genetic variant is to be pathogenic. “This approach is the real novelty of the present study,” he wrote. Studies of twins have pegged the overall heritability of SALS as high as 60 percent (see Al-Chalabi et al., 2010). However, three genome-wide association studies indicate the current set of ALS-linked genes explain just 21 percent of SALS, and other studies have come up with similar numbers (see Jul 2014, Nov 2014 news; Renton et al., 2014). None of these studies attempted to weed out harmless variations that might inflate genetic risk estimates. To better determine the contribution of known ALS genes, the authors sequenced the whole exomes of 87 SALS patients of European ancestry who were being seen at the University of Utah. None of them had a family history of the disease. Downie and colleagues looked for repeat expansions in C9ORF72 and ATXN2, plus for rare coding variants among 31 other ALS genes. Altogether, they identified 28 variants in 25 patients. Five of the variants were C9ORF72 expansions, two were ATXN2 expansions, and two were pathogenic SOD1 alleles. The other 19 coding variants had not been previously linked to ALS. To determine if these 19 variations were harmful, the authors used a method called MetaSVM, which combines scores from several different pathogenicity prediction algorithms (Dong et al., 2015). The analysis concluded that only six of the19 would alter protein function. The upshot: 15 of the 87 participants, or 17.2 percent, likely had genes that contributed to their disease. Compared with a cohort of 324 healthy controls, the sporadic ALS patients were almost five times as likely to carry an ALS-linked variant predicted to be harmful, but had only a slightly higher chance of carrying any variant in an ALS-linked gene. The results demonstrate the importance of focusing on genetic associations predicted to be pathogenic, Downie told Alzforum. Because the harmful variants all occurred in genes linked to familial disease, it is possible these cases represent unrecognized familial ALS, Downie said. Familial disease can sometimes fly under the radar, either because only a single case shows up in small families, or because new mutations in the germline cause it. This study cannot determine whether the genetic variants it found caused disease or merely heightened risk for it, Downie noted. For example, the SOD1 mutation that turned up typically acts recessively, but neither of the two people affected carried two copies. It is unclear if the gene acted dominantly, predisposed the carriers to the influence of other genetic or environmental risk factors, or had no effect. At least one study has reported a dominant mode of action for the mutation (Al-Chalabi et al., 1998). The findings also emphasize that the ALS genes known to date account for only a small portion of the predicted genetic risk in sporadic disease. Larger studies are needed to find the missing genes, Downie noted. Genetic studies involving thousands of ALS patients are ongoing, such as Project MinE in the Netherlands. Gibson SB, Downie JM, Tsetsou S, Feusier JE, Figueroa KP, Bromberg MB, Jorde LB, Pulst SM. The evolving genetic risk for sporadic ALS. Neurology. 2017 Jun 22; PubMed. Al-Chalabi A, Fang F, Hanby MF, Leigh PN, Shaw CE, Ye W, Rijsdijk F. An estimate of amyotrophic lateral sclerosis heritability using twin data. J Neurol Neurosurg Psychiatry. 2010 Dec;81(12):1324-6. Epub 2010 Sep 22 PubMed. Dong C, Wei P, Jian X, Gibbs R, Boerwinkle E, Wang K, Liu X. Comparison and integration of deleteriousness prediction methods for nonsynonymous SNVs in whole exome sequencing studies. Hum Mol Genet. 2015 Apr 15;24(8):2125-37. Epub 2014 Dec 30 PubMed. Al-Chalabi A, Andersen PM, Chioza B, Shaw C, Sham PC, Robberecht W, Matthijs G, Camu W, Marklund SL, Forsgren L, Rouleau G, Laing NG, Hurse PV, Siddique T, Leigh PN, Powell JF. 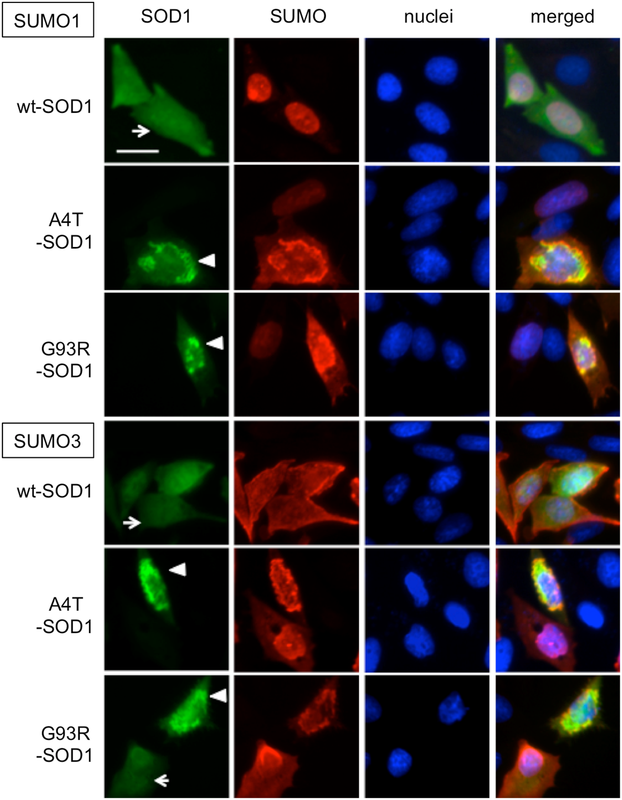 Recessive amyotrophic lateral sclerosis families with the D90A SOD1 mutation share a common founder: evidence for a linked protective factor. Hum Mol Genet. 1998 Dec;7(13):2045-50. PubMed. Renton AE, Chiò A, Traynor BJ. State of play in amyotrophic lateral sclerosis genetics. Nat Neurosci. 2014 Jan;17(1):17-23. Epub 2013 Dec 26 PubMed.